After the Order of the Temple was dissolved in Britain in July 1311, the Templars were sent to monasteries to do penance for their alleged sins. As no monastery received more than one Templar, they were scattered across the country. Individual bishops issued instructions for the Templars entrusted to their care, but many of these instructions have not survived. Sometimes individual Templars were mentioned in government documents or bishops’ records, but others simply fell out of view. When I wrote The Knights Templar on Trial I tried to find out what had happened to each of the Templars in Britain. Alan Forey had found a great deal of information, published in his article ‘Ex-Templars in England’, Journal of Ecclesiastical History 53.1 (2002), 18–37. But some Templars remained elusive. One of the elusive Templars was Henry of Halthon or Althon, lieutenant-commander of the Templars’ commandery of Lydley in Shropshire. 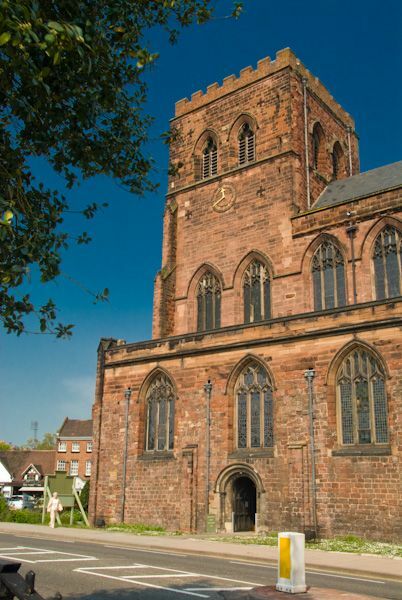 It was known that he went to a monastery in the diocese of Coventry and Lichfield, but which monastery? The mystery is now solved! 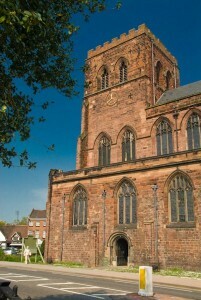 Henry went to the Abbey of St Peter’s in Shrewsbury. At the very end of the second copy of the enrolled accounts for the Templars’ former estates in Shropshire and Staffordshire for 1311–13 (The National Archives E 358/19 rot. 36 dorse) is a section setting out the payments to be made to former Templar employees and members in those two counties for those years. There are payments to John of Golstrode, who worked at the manor of Lydley; Richard Neville, ditto; and Master Richard of Gloucester who was paid an annual pension and wages for his clerk and a garcio (a lad or boy). Then there are payments of four pence a day to Brother Thomas of Wohope, former commander of Temple Bisham, who was at Much Wenlock Abbey; and Brother Henry de Halghton, who was at St Peter’s Abbey, ‘Salop’ (i.e., Shrewsbury). Brother Henry’s new home was a Benedictine abbey which was relatively close to his former base at Lydley, in a town where the Templars owned a house worth 20 shillings a year (TNA E 358/18 rots 4 and 54). Perhaps he already knew some of the monks there. But this information is not in the first copy of the enrolled accounts, only in the second, corrected copy: demonstrating the importance of checking all the records, and not only a selection. Which Templars in Britain remain elusive? Can we help search? Would their reassignments be recorded in the Vatican archives? Thanks for your comment! The pope left the reassignments of Templars in the hands of the relevant provincial councils (so, in England and Wales this was the responsibility of the archbishops of Canterbury and York and their subordinate bishops). This information does not seem to have been included in the reports sent back to the pope in 1311. A more likely place for information is the individual bishops’ registers, which Alan Forey went through for the article I mention in my blog post. There are some references in the royal custodians’ accounts from the Templars’ estates, which are in the National Archives at Kew: the blog was about one of these. The problem is that some of the government records only stated which diocese the Templars were sent to rather than which religious house, and when the bishops noted which Templars they were responsible for they did not note which religious house they were in. So although we know generally where these Templars went after July 1311 we don’t know exactly where they were. 1 Alexander of Althon or Halthon: probably died before April 1311: but I haven’t yet found out when he died — this information should be in the custodians’ accounts somewhere. 2 Alexander of Bulbeke: likewise. 3 Edm Latimer or Barville — a fugitive Templar who avoided arrest in January 1308 and did not reappear. 4 Geoffrey of Welton or Winton: after the trial was over he was sent to a religious house in the diocese of York, possibly Whitby Abbey, but this isn’t certain. 5 Godfrey of Archis (i.e., of Bowes): after the trial was over he was sent to a religious house in the diocese of York, but it is not clear which one. 6 Henry Paul or Pawel: after the trial was over he was sent to a religious house in the diocese of Chichester, but it is not clear which one. 7 Henry of Roucliffe or Rawcliffe: same issue: in this case the diocese of York. 9 Henry de la Wole, Valey, or Wolde: was ‘old and decrepit’ when he was absolved in July 1311 and so far I have not found out where he was sent for penance. It is very likely that he died before he could be sent to a new religious house. 10 Ivo of Houghton or Etton: after the trial was over he was sent to a religious house in the diocese of York, but it is not clear which one. 15 John of Hauvile or Hamil: was reported to be ‘demens’ or insane, and I have not found any record of which religious house he was sent to. 16 John of Usflete: a fugitive Templar; but in 1316 a man with this name was reported to be in Ousefleet (from which the name ‘Usflete’ comes) with people related to Brother John of Usflete — so he had probably simply gone home to his family in Ousefleet. 17 John of Poynton: a fugitive Templar who avoided arrest in January 1308 and did not reappear. 18 John of Sutton, also know as ‘of Stoke’: he was last heard of in July 1311, when he abjured heresy. As he was not mentioned again, perhaps he died in July 1311. 19 John of Waddon: after the trial was over he was sent to a religious house in the diocese of Worcester, but it is not clear which one. 20 John Wergrave: after the trial was over he was also sent to a religious house in the diocese of Worcester, but again it is not clear which one. 21 Michael of Sowerby: after the trial was over he was sent to a religious house in the diocese of York, but it is not clear which one. 22 Philip de Meux or de Melsa: he abjured heresy in July 1311 but was not mentioned again in the records, so perhaps he died in July 1311. 23 Ralph of Barton: after the trial was over he was sent to a religious house in the diocese of Coventry and Lichfield, but it is not clear which one. 24 Ralph of Bulford: a fugitive Templar who avoided arrest in January 1308 and did not reappear. 25 Ralph of Maldon: after the trial was over he was sent to a religious house in the diocese of Norwich, but it is not clear which one. 26 Ralph of Tanet or Chanet: same issue, this time the diocese of Norwich. 27 Ralph of Evesham: same issue, this time the diocese of Coventry and Lichfield. 29 Richard of Colingham: after the trial was over he was sent to a religious house in the diocese of Bath and Wells, but it is not clear which one. 30 Richard Poitevin: same issue in the diocese of London. 31 Richard of Ripton: was sent to ‘B. Abbey’ in the diocese of York — possibly Bolton or Burstall. 32 Robert de Cavill or Cammvile: abjured heresy in July 1311 but was not mentioned again; presumably he died in July or August 1311. 34 Robert of Spanthon, Spaunton or Standon: same issue, this time in Norwich diocese. 35 Robert of the Wolde: was ‘old and decrepit’ when he abjured heresy in July 1311; was not listed with those sent to a religious house, so presumably he died in July 1311. 36 Stephen of Stapelbrugge (Stalbridge): after the trial was over he was sent to a religious house in the diocese of Winchester, but it is not clear which one. 38 Thomas of Burton or Barton: same issue, this time in the diocese of Worcester. 39 Thomas of Hagworthingham: same issue, in the diocese of Winchester. 40 Thomas of Lindsey: fled to Ireland but returned in 1312 and was sent to a religious house; but it is not clear where. 42 Thomas of Thoroldby or Totty: same issue, but this time in Winchester diocese. 43 Thomas of Walkington: same issue, in the diocese of Coventry and Lichfield. 44 Walter the Rebel: a fugitive Templar. He may be the same as the Brother Walter le Lung (‘the Long’) mentioned in Ireland in 1308. 45 Walter of Rockley: after the trial was over he was sent to a religious house in the diocese of Winchester, but it is not clear which one. 46 William of Chesterton: same issue, in the diocese of Norwich. 47 William of Grafton junior: a fugitive Templar who handed himself in before 1313, but it is not clear to which religious house he was sent. 48 William of Hereford or Hertford: abjured heresy in July 1311 but was not included in the lists of Templars sent to a religious house. 49 William Scotho: after the trial was over he was sent to a religious house in the diocese of Worcester, but it is not clear which one. 50 William of Warwick: same issue, in the diocese of Bath and Wells. 51 William of Welles: same issue, in the diocese of London. 52. William of Winchester or Winton: same issue, in the diocese of Norwich. You will see that only three of the names above vanished completely. For the others, the records follow them up to a point and then stop. The obvious solution for those who dropped out of the records in spring or summer 1311 is that they died. For those who are recorded being sent to a specific diocese but not a specific house, there is probably a record either in the bishops’ registers or the exchequer records in the National Archives which states where they went: it is just a matter of finding it. If you happen to be looking in any of these records and you find any of these names, do please let me know.